Eustigmaeus frigida, copyright D. E. Walter. 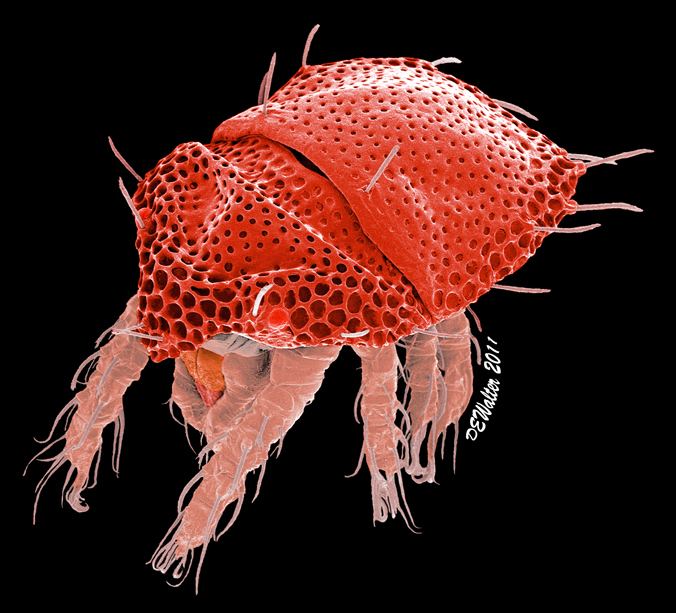 Eustigmaeus is a cosmopolitan genus of parasitic or bryophagous mites (Faraji et al. 2007). Characters (from Faraji et al. 2007): Dorsum with 3 shields, prodorsal shield with 4 pairs of setae and usually one pair of eyes, opisthosomal shield with 6 pairs of setae and suranal shield with 2 pairs of setae; humeral setae c2 situated on triangular shields, displaced to a ventral or ventrolatral position; dorsal shield generally sculptured or ornamented; legs shorter than idiosoma; gnathosoma partly covered by overhanging prodorsum; palp 5-segmented, with a tridentate, terminal eupathidium; primary claw on palptibia well developed, with a smaller accessory claw at its base; chelicerae not joined together; venter with 2 or 4 endopodal shields which may be united or divided midventrally; aggenital area with 1 to 3 pairs setae and pseudoanal covers with 3 to 4 pairs of setae. [FUB07] Faraji, F., E. A. Ueckermann & F. Bakker. 2007. First record of Eustigmaeus jiangxiensis Hu, Chen and Huang (Acari: Stigmaeidae) from France with a key to the European species of Eustigmaeus Berlese, 1910. International Journal of Acarology 33 (2): 145–151.